The sight of an intense flash of light stretching from cloud to cloud or to the ground makes some people cover their ears in fright or run for cover. The sound of loud explosion reverberating across the sky can be frightening. Some thunders can be so loud that even the ground trembles at its mighty roar. But despite the enormous sound of thunder, it’s nothing more than just air rapidly expanding as lightning weaves its way through the skies. Almost every time you see a lightning, a thunder would ensue. You can judge the distance or proximity of a lightning by the length of time a thunder was heard after the flash of light was seen; the closer the lightning, the lesser the time for sound to travel through the air, and the further the lightning, the more time it takes. 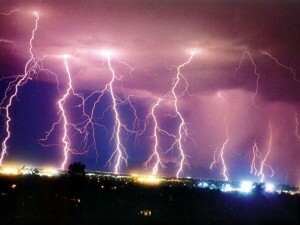 At very close range, lightning would come thundering with a loud noise. So where does lightning come from? During a thunderstorm, the rapid movement of air in a thundercloud causes some particles to be electrically charged. Eventually, the particles on top of the thunderstorm displace some of its electrons causing the cloud to be positively charged. On the other hand, the particles on the bottom become negatively charged, creating tension between the upper and lower part of the thundercloud. Lightning is seen as a result of releasing the tension, neutralizing and creating a balance in the electrical distribution in the atmosphere. The intense heat (5 times as hot as the sun’s surface) generated by a massive electrical discharge causes the air to expand in just a fraction of a second. Consequently, the compressed air around it is now 100 times higher than the normal air pressure, creating a shock wave that can be heard for thousand yards in every direction. It’s the rapid explosion of air that generates the sound of thunder. No wonder thunders and air raids sound alike. Thunders vary in loudness due to the distance and length of the lightning. The further away the lightning strikes from the hearer, the quiter the thunder. But irrespective of distance, a thunder becomes excessively loud due to the length of the lightning’s electrical discharge which is proportionate to the sound it creates.